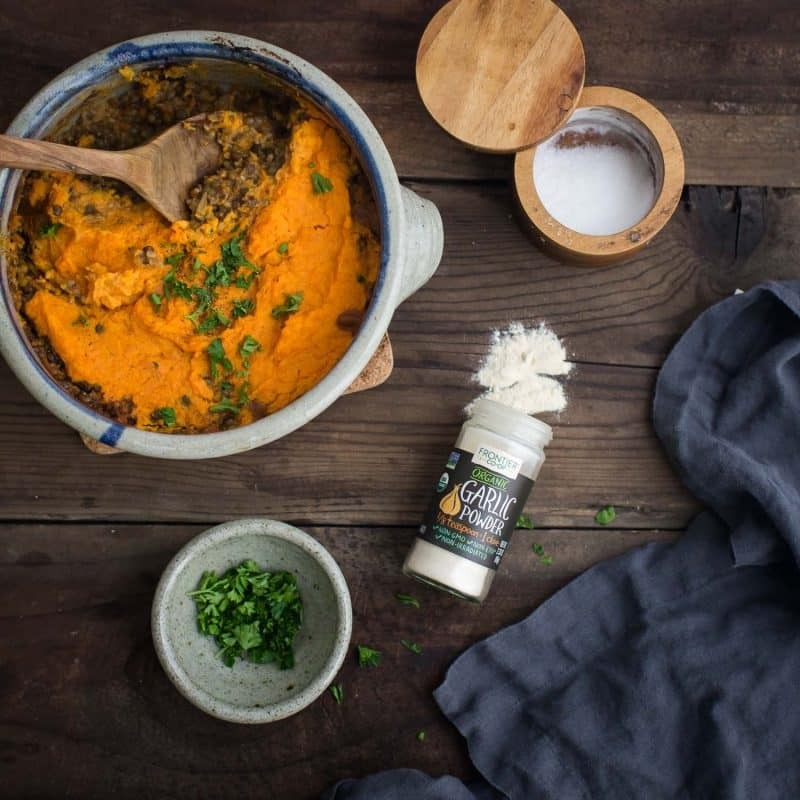 Lentil Shepherd's Pie with Sweet Potatoes | Naturally. This recipe is in partnership with Frontier Co-op. See below for more details. I’m always hesitant to share a recipe that has been done many times before. 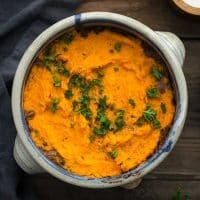 There are countless recipes for lentil Shepherd’s pie floating around but I’m really in love with my version. The major differences: no mushrooms (sorry to the mushroom lovers) and bulgur. I love bulgur as a meat-swap. Most notably, in this chili. Bulgur, combined with lentils, a mirepoix and Frontier Co-op’s garlic powder, make for a stellar and hearty filling. Perfect for a Shepherd’s pie! 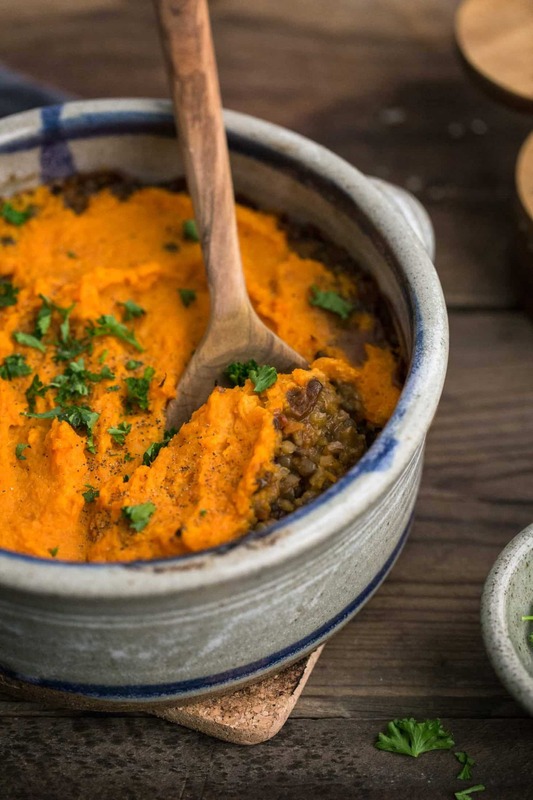 A hearty vegetarian main dish, this lentil shepherd’s pie using French lentils cooked with bulgur to add texture and heft to the overall dish. In a medium pot, combine the lentils with the water and salt. Bring to a boil, reduce to a simmer, cover, and let cook for 15 minutes. Stir in the bulgur, cover, and cook for another 10 to 15- until the lentils and bulgur are tender and water is gone. While lentils are cooking, peel sweet potatoes and cut into chunks. Bring a pot of water to a boil and cook sweet potatoes until tender, 10 to 15 minutes. Drain and place in a bowl. Add cream and salt then mash until smooth. Set aside. Heat oven to 425˚ F and set aside a casserole dish. Heat a pot or dutch oven over medium heat. Add the olive oil, followed by the minced onions, carrots, and celery. Cook until the vegetables are fragrant and soft, 6 to 8 minutes. Stir in the flour and cook for a minute more then add the salt, pepper, rosemary, thyme, garlic powder, Worcestershire sauce, tomato paste, and lentil mixture. Stir until well combined then add the broth. Bring to a boil and let thicken for a couple minutes. Transfer the mixture to a baking dish and top with the mashed sweet potatoes. Bake for 20 to 25 minutes, until the sweet potatoes are browning and the filling is bubbling. Serve with a sprinkle of parsley and freshly cracked black pepper. Tips & Tricks: Look for vegan Worcestershire- my favorite brand is Annie’s. Stock up: get the pantry ingredients you will need: bulgur, lentils, sweet potatoes. This is one of those recipes that I’m pretty staunch in how I make it. The bulgur/lentil combination is perfect for me and I’m not shy about using heavy cream. However, there are a few options for those wanting to go a vegan/gluten-free route. Vegan/Gluten-free: To make vegan, simply replace the heavy cream with non-dairy butter or an almond creamer. I’d shy away from using coconut milk/cream as the flavor wouldn’t work well with the filling. 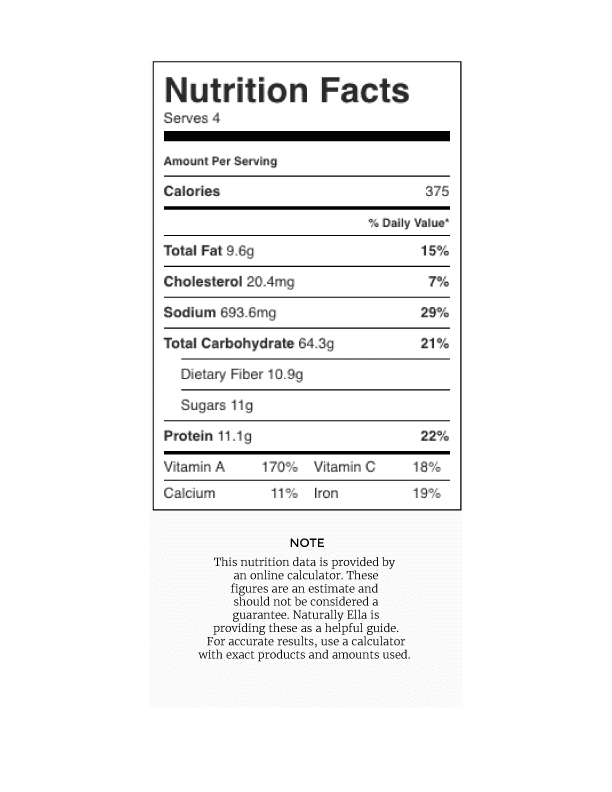 Gluten-Free: It’s hard to have a gluten-free comparison for the bulgur so you could leave it out completely for substitute millet or quinoa- just account for the increased cooking time. Then replace the flour with a gluten-free alternative. 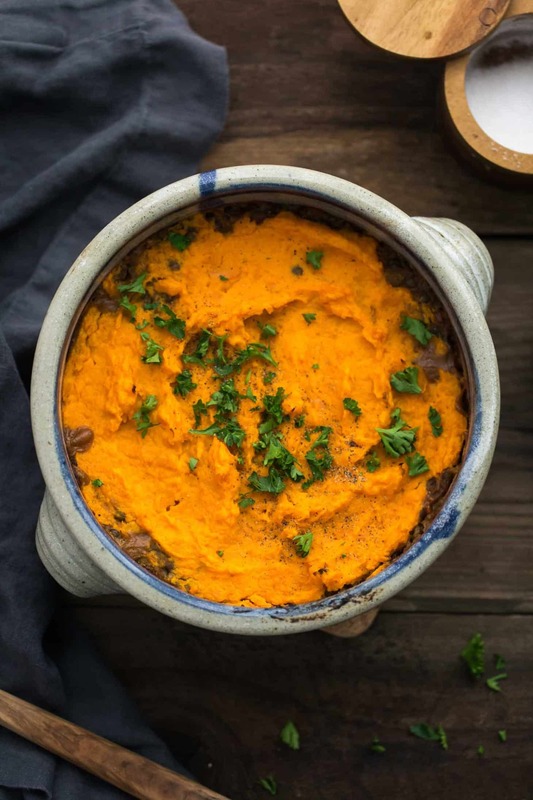 Root Vegetables: The traditional topping for Shepherd’s pie is regular whipped potatoes. This is great but I love sneaking more vegetables into the topping. Try mashed rutabaga, parsnips, or even cauliflower. I know there are people who are against using garlic powder because garlic cloves are easy enough to use. I, however, always have garlic powder or granules on hand. Garlic powder is perfect for spice blends and dry rubs. It’s also great for those times when you want an extra punch of garlic but don’t have the cloves in your pantry. My favorite use? Toss with smoked paprika and sprinkle on popcorn. I love your idea of adding mashed cauliflower or rutabega to the sweet potatoes. Some of my favorite things. Also, thank you for embracing heavy cream! I haven’t tried it but I think it would- I’d freeze before the final baking and let thaw then bake. Hi. What would you recommend as a substitute for the lentils? My husband is pretty opposed to them. Thanks! You could do a smaller white bean (like navy bean)- you would want to add them cooked right before baking. Your recipe doesn’t add the lentils back in…looks delicious! I’m not against garlic powder…but 2 tsp seems like a lot! Yikes! Just updated where the lentils go into the pot and I just check my notes- it’s 1 teaspoon! Ah shoot! Just added it- thanks for the catch! Thank you so much for sharing this recipe!! I just made it and it is SO GOOD! Thank you so much! I made this tonight. Really flavourful and delicious. Delicious with a capital D! As an avid vegetarian always on the lookout for yummy and versatile recipes, this one is a keeper. Thank you! ? This looks delicious, I can’t wait to try! Do you think it would keep well to prepare everything the night before and just pop the compiled dish in the oven for the last 20-25 minutes of baking the next evening? I do! You might need to cook it slightly longer so that everything is hot, but it should still work! I just served this and really loved it! The perfect fall/winter meal. The only change I made was adding an extra carrot, because I love carrots. Also, I thought the lentils and bulgur were done (I cooked them the recommended time), but when I added them to the veggie mix, I realized the lentils were still a little hard. So I added some extra water and cooked them a bit longer in the mix. Just something to keep an eye on while you’re making it.